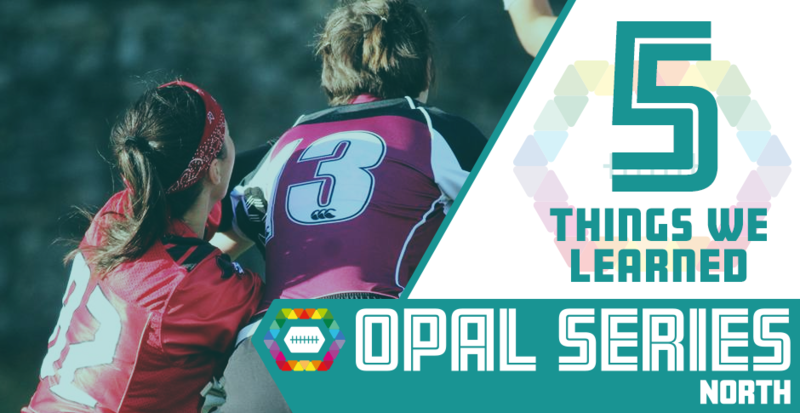 Week two of the Opal Series saw a clash at the top, with the Sheffield Giants and East Kilbride Pirates clashing! Elsewhere, the Manchester Titans and Chorley Buccs would continue to jostle for possession of a playoff spot! Here’s how all the action unfolded! The Pirates and Giants both had intensely close contests last season, tying the series 1-1. Both games came down to the very last plays, and with superior points differential, and a larger margin of victory, the Giants went to playoffs as the #1 seed. The Pirates once again didn’t quite manage the output of the Giants on the scoreboards, but in their tussle with the Sheffield side, they came up big with a resounding 31-19 victory. The Giants scored on their first possession as some missed tackles from the Pirates gave Sheffield great field position to work with. The Pirates offence responded through Louise Donnelly, who was a consistent source of frustration for the Giants defence. From then on, there seemed to be only one winner. The Pirates defence tightened up, and Kerry McLaughlin came up with a leaping interception to give her side a critical possession deep in Giants territory. From then on, it was relatively plain sailing for the Pirates, as they took a valuable victory on enemy soil. The Giants came into the game without standout WR Marta Mathews, but there’s enough quality for them to still have felt like this is an opportunity wasted. In their other contests, they were dominant, but this could be a huge loss for them come season’s end. The Pirates meanwhile powered to 8-0, and look forward to their next set of games in Manchester. While all that was going on at the top, the Nottingham Gold made waves of their own with an exceptional output on game-day two. 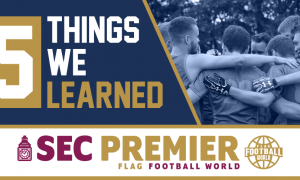 With an opportunity to add to an already much-improved side from last season, the new blood for the Gold team gave them a 2-2 record on the day, with a big win over the Hallam Rangers, and an even bigger win over the Manchester Titans! 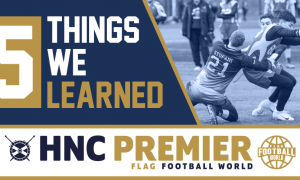 Even in their losses, the Gold outfit put in much improved performances, with an excellent first half against the East Kilbride Pirates, and a strong showing against the Hallam Warriors. The Green side of the Nottingham football squad also had a great day, and have already improved on their points total from last season! The future looks bright for flag football in Nottingham! The Chorley Buccs did well in week one, going 3-1 and putting themselves firmly in contention to return to the playoffs. 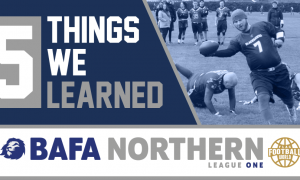 Losses to the Pirates and Warriors dented their overall seeding, but a comfortable win over the under-strength Manchester Titans gave them some distance in the fight for fourth. This is another result which could go a long way in shaping the season, as now the Titans can’t afford to slip up again. The Buccaneers have the recipe for success, with mistake-free football keeping themselves in every contest. While the top two battled, and the fight for fourth was contested, the Hallam Warriors continued their solid season with another 3 wins, with one sole loss coming against the Giants. The Warriors defeated the Nottingham sides, but their win over the Chorley Buccaneers cemented their grip on the third spot. Their defence played perfect football against the Buccaneers short passing game, as only their offence cost them a chance at a shut-out! The final score was 37-2, as the Warriors now look to take down the Titans. We need to recognise the fantastic job the Hallam outfit did of giving the scheduled break in proceedings some added importance. Between the Hallam Warriors and Hallam Rangers, a bake sale was organised in support of Mind Sheffield, a mental health awareness charity. Valuable money was raised for an excellent cause, and we commend the Hallam programme for their efforts! The cakes were lovely as well!